Electrical wiring in domestic and commercial properties can be dangerous and in many cases fatal if dealt with by untrained hands. It is important to leave any electrical wiring work to trained and qualified electricians for the safety of you and everyone within your property. 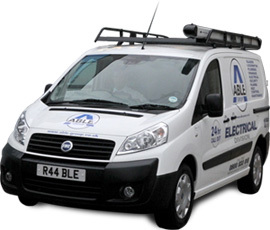 Able Electric supply trained and qualified electricians for all electrical wiring work. If your property needs re-wires or electrical wiring repair to lights, plug sockets, outlets etc... We can have a professional electrical engineer to your door within 30-90 minutes of calling. Our trained 24/7 operational staff can help you with any electrical query you have and can provide free estimates or quotes.